On the site… When women started working on construction sites, is unknown… From the surviving accounts, it would seem, that when a medieval thatcher was working; the chances are he had some female helpers. 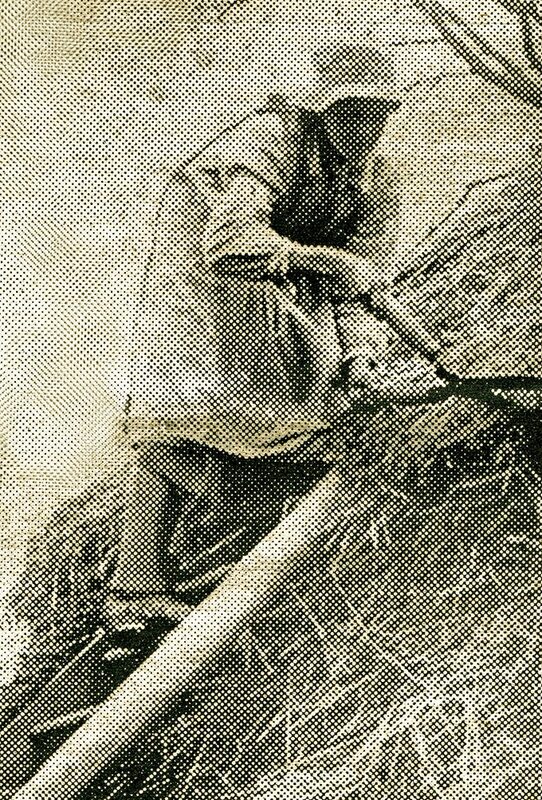 In the page on thatching in the later middle ages; the labours of one female assistant have already been seen, working for a fourteenth century thatcher. Here ecclesiastical employers, at Ripon in Yorkshire, were paying 5d a day in 1399; to a thatcher working in the town’s Cornhill district. His female helper received 15d, for five days: ‘serving the thatcher‘. Later records, give us some names for the thatcher’s assistants… In 1443, Katherine Coke and Alice Carleton each received 2½d a day. 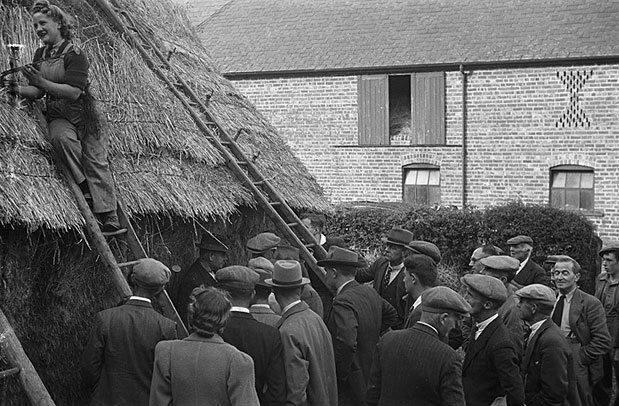 For: ‘drawing thatch and serving the thatchers‘; at Hedon in Yorkshire. 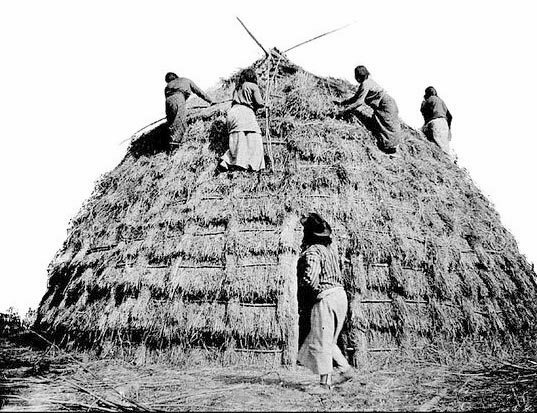 They yealmed 2d worth of barley straw and mixed the mortar for the ridge. 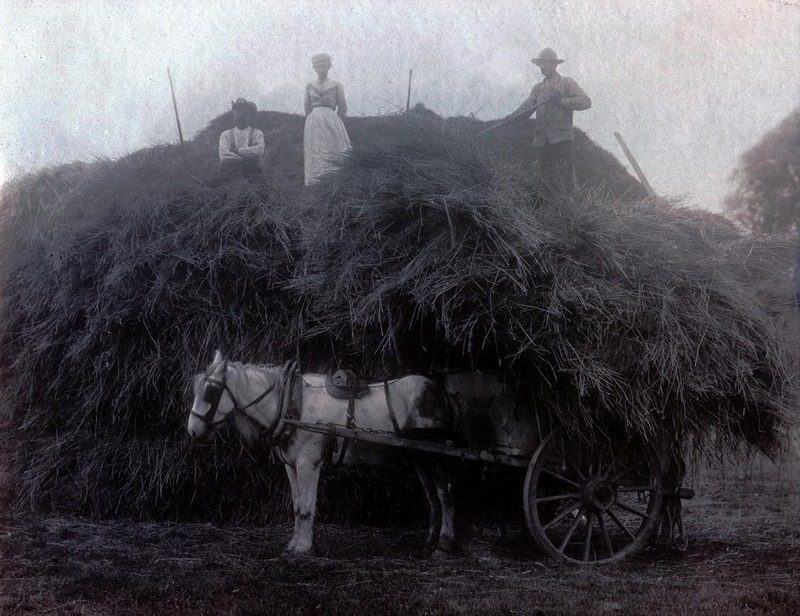 The working setup of a thatcher, with labouring women, was described in neighbouring Wiltshire in the 1870’s, by local writer Richard Jefferies. 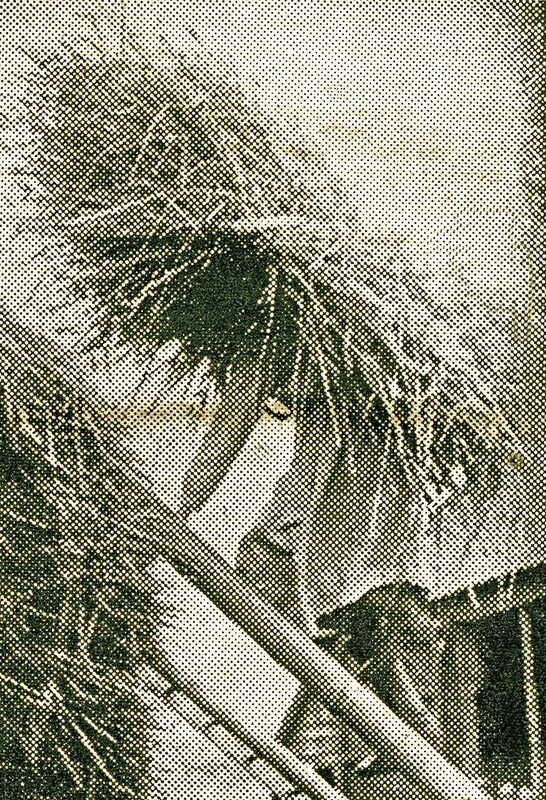 In ‘Wildlife in a Southern County’, he describes his local thatcher as a man of ‘no little consequence… the most important perhaps of the village craftsmen.’; full of ‘infinite gossip’. The author noted that this thatcher had things well organised. 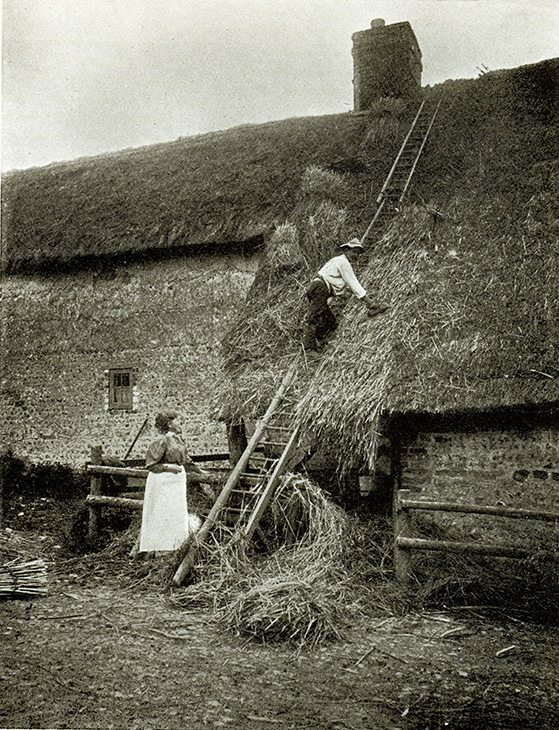 On both ricks and houses he stayed up the ladder, laying thatch. 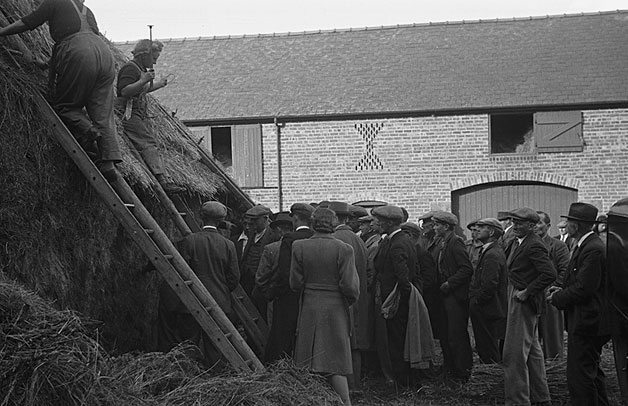 An assistant was engaged, just bringing up full yokes of long straw and thatching spars. He was in turn, being helped by two or three women; doing the backbreaking jobs, of yealming and yoke filling. This gang must have covered quite an area of roof, in a long nineteenth century working day. 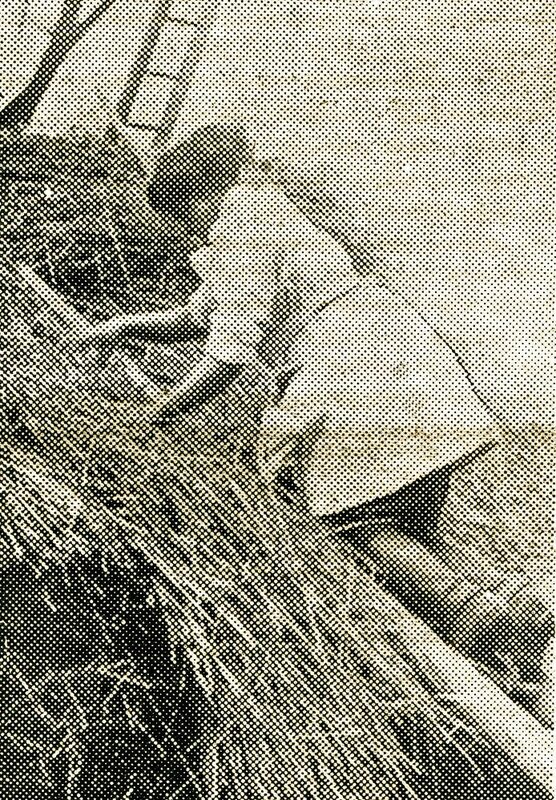 On the Land… Apart from working in the trade, women were also closely involved in the production of cereal straw thatch. 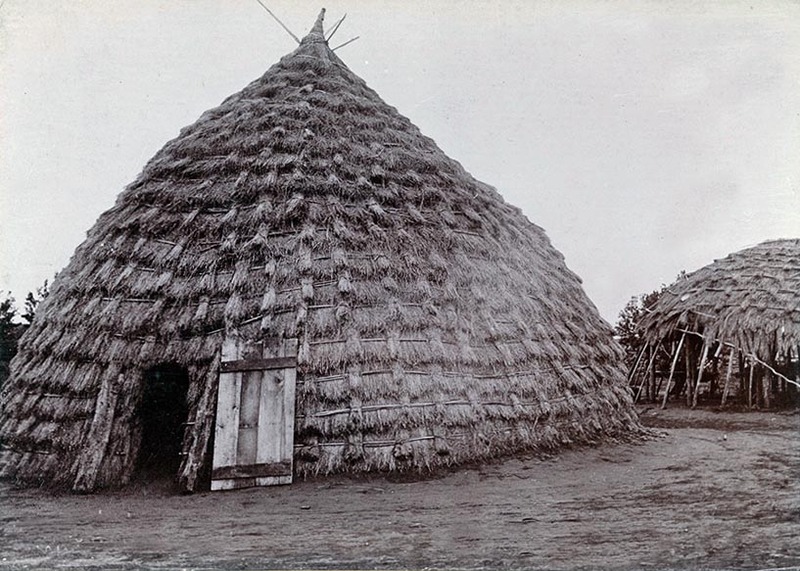 The gathering and storage of the harvest, could literally be a matter of life or death, in a subsistence economy. 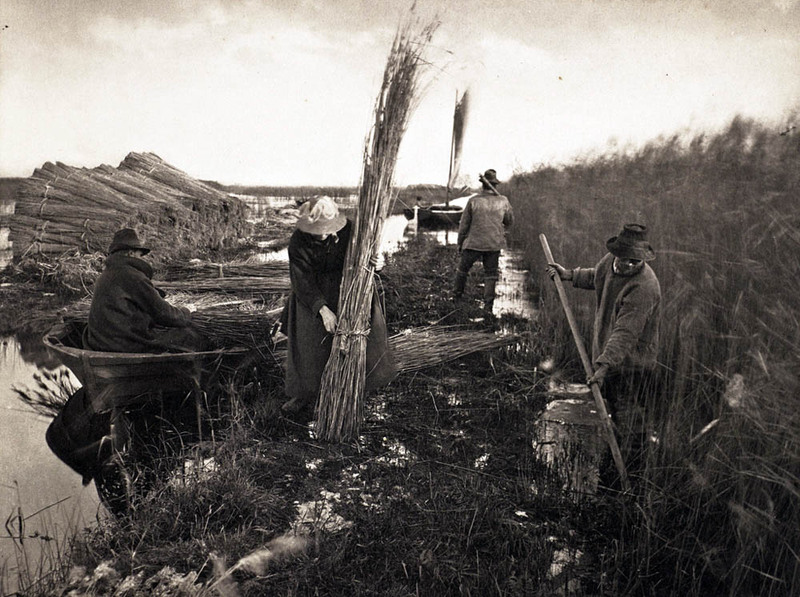 In times past everyone took part in harvesting the grain and thatch for the coming year. In 1809, the Agricultural Reporter noted, in Oxfordshire that. 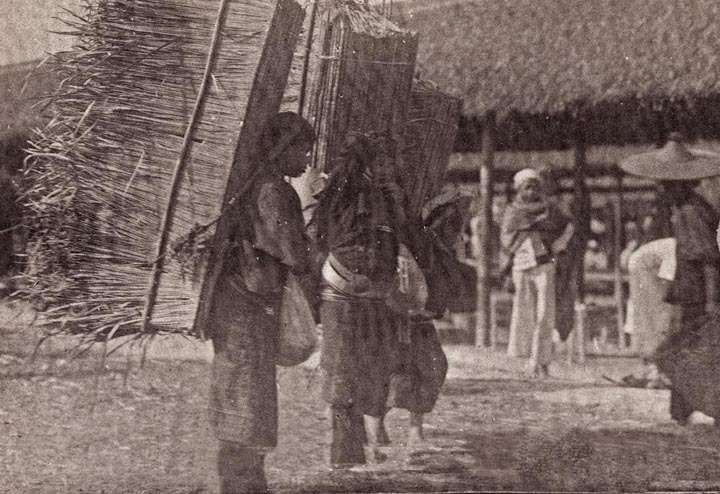 ‘All the women about Baldon reap in harvest…’ For working every daylight hour, they received ten shillings a week. 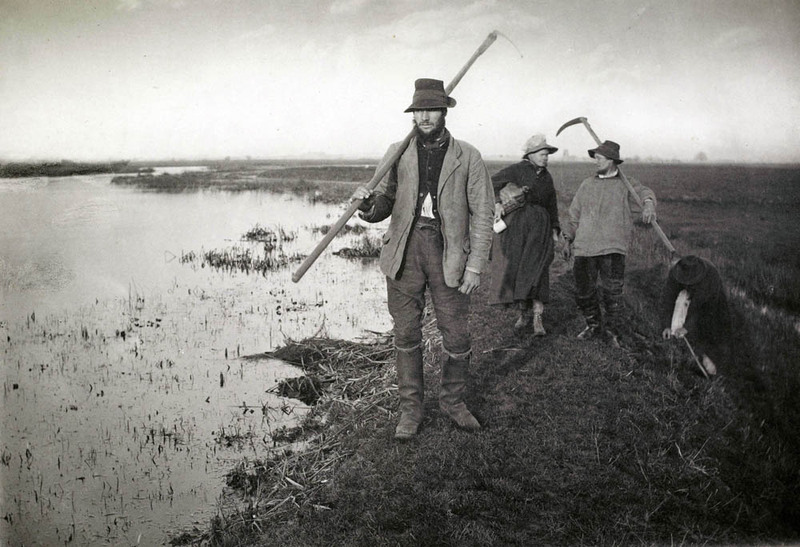 Men earning more; showing the darker side of farm work, for women. 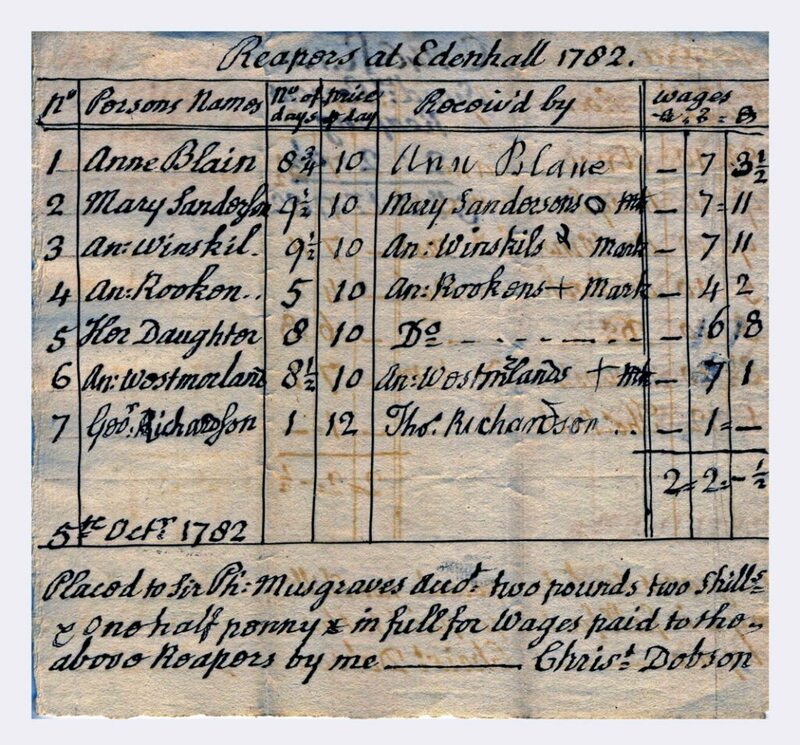 1… At Edenhall Estate, Cumberland, in the year 1782. 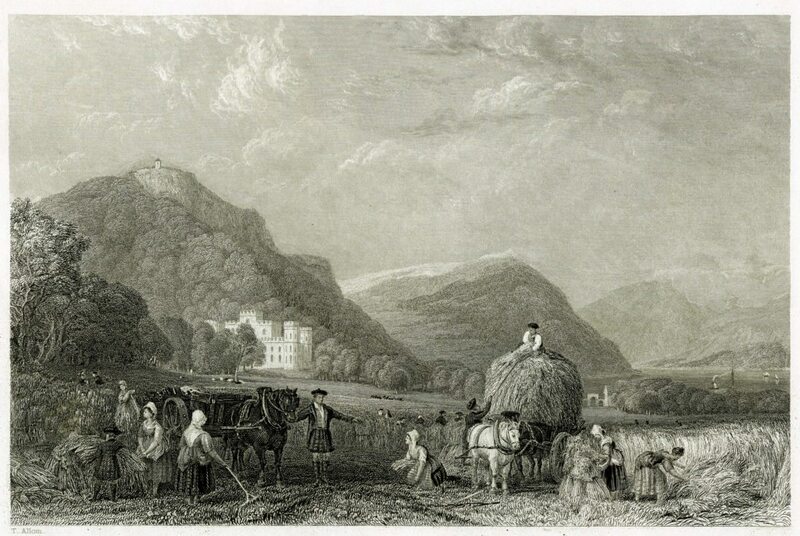 2… Near Invererary Castle, in the early nineteenth century. Everyone was needed to reap and gather, in this Argyll field. In 1797, the Agricultural Reporter noted, that it was a Berwickshire farm worker’s wife, who paid their cottage rent. By the work she did, at planting and harvest times. 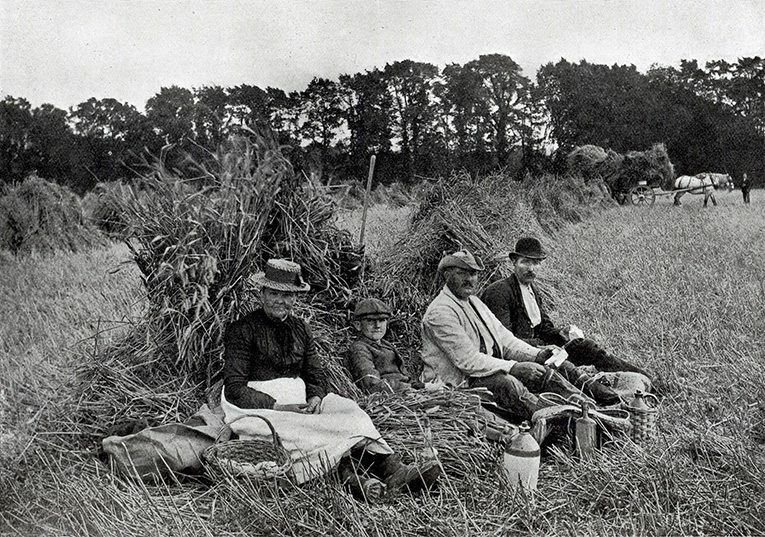 Taking a break… In a Berkshire harvest field. 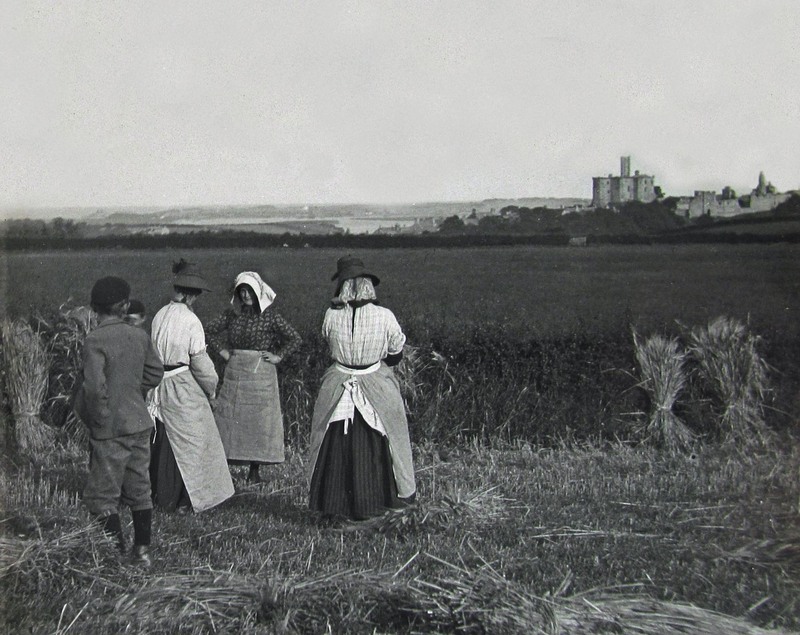 A scene captured, by a Mr Vasey, in around 1910. 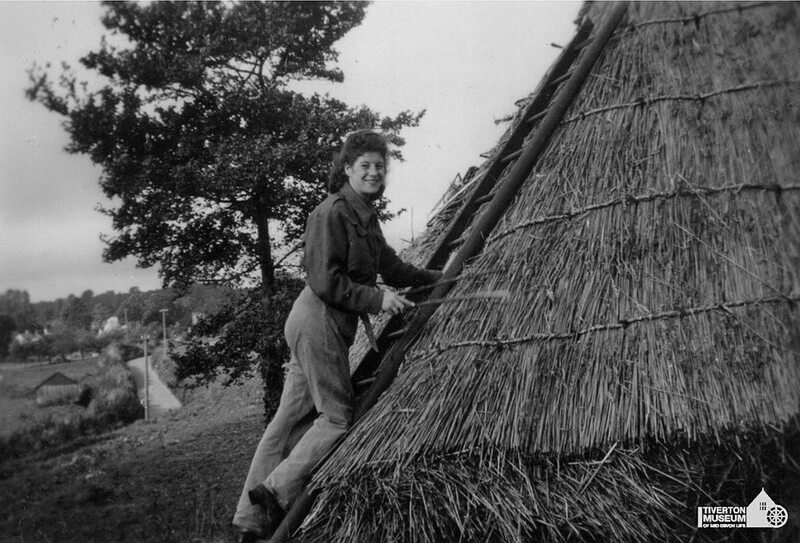 This ‘Mrs Edicott’, is well prepared, with her stout apron and hob nailed boots. The young lad would not have skipped school; as academic institutions, have shut down in the summer for centuries. 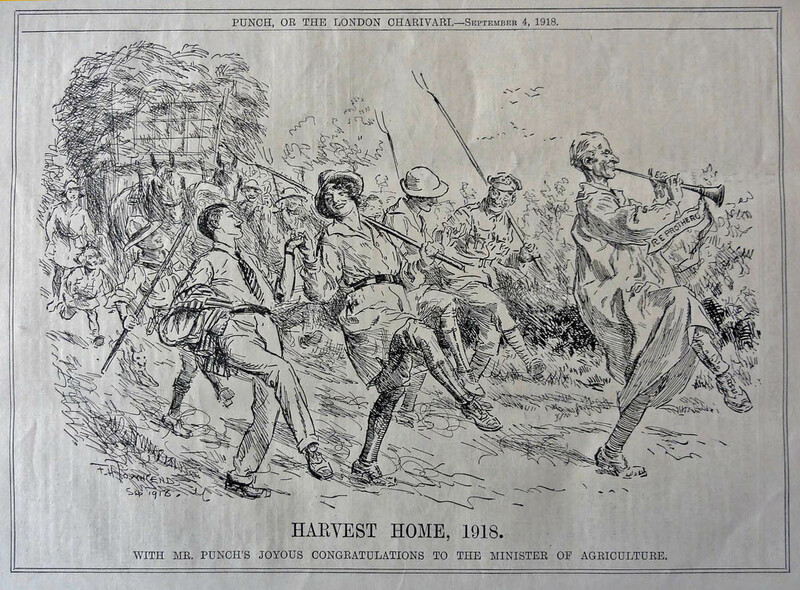 To free up some labour, for the vital harvest. On the Broads…. As well as in the fields and rick yards. Radical measures were called for, then enacted. Five days after the outbreak of war, all suffragette prisoners were released; unconditionally. 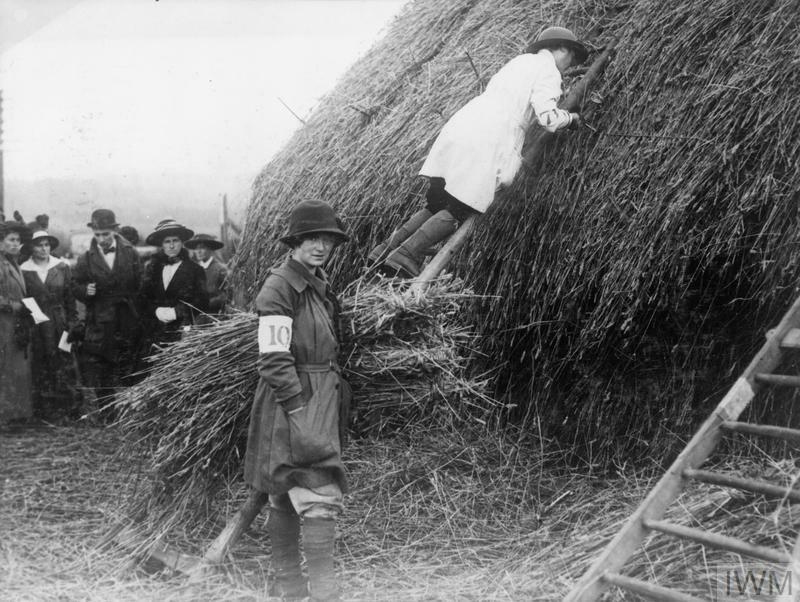 Mrs Pankhurst said: ‘What is the use of fighting for a vote if we have not got a country to vote in.’ Countless more taboos were broken, when a Women’s Land Army was eventually established. The volunteers quickly being named, Land Girls. Sign up… A desperate government needed help, for all aspects of food production. 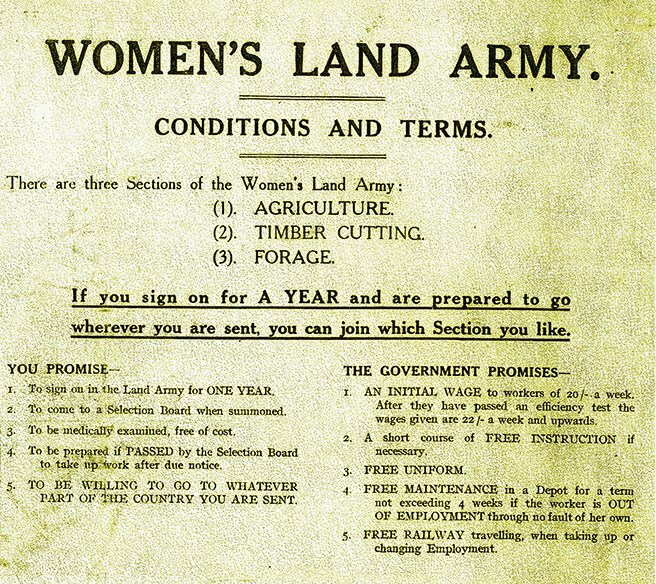 As this leaflet from 1917 shows. 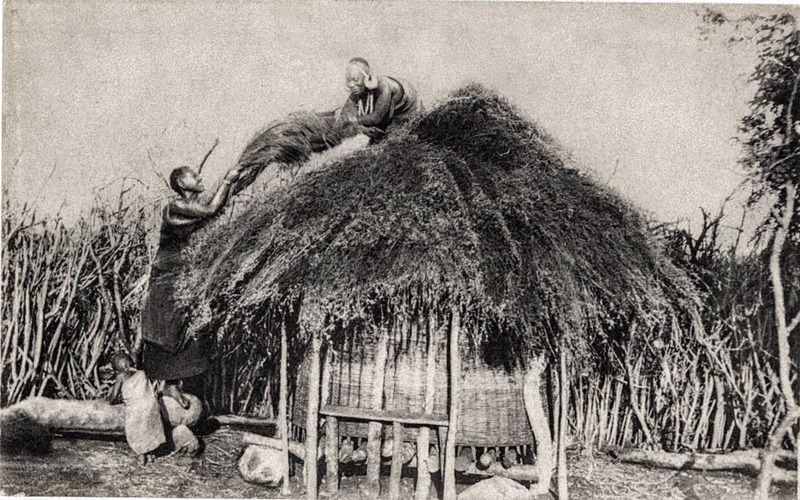 The image below, shows another competition, each girl having to complete a strip of work, from eaves to ridge. Photo; © IWM (Q 54604), thanks. 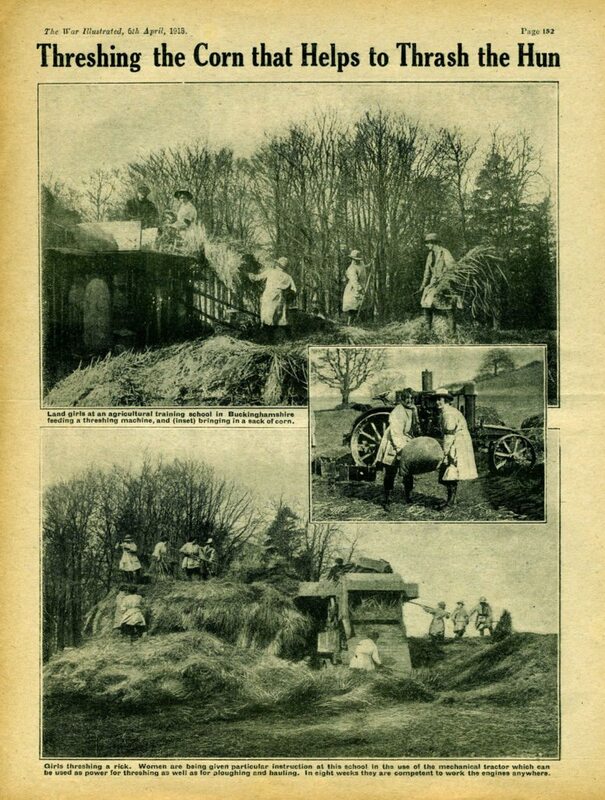 In 1939, the start of the Second World War, saw Britain having to plough up two million acres, just to get back to the production levels of 1914… But at least a new Women’s Land Army was soon up and running. Once again volunteers were needed; aged between 19 and 30. One third of the new recruits came from the cities of The North, London and it’s suburbs. These city girls often proved the best workers. 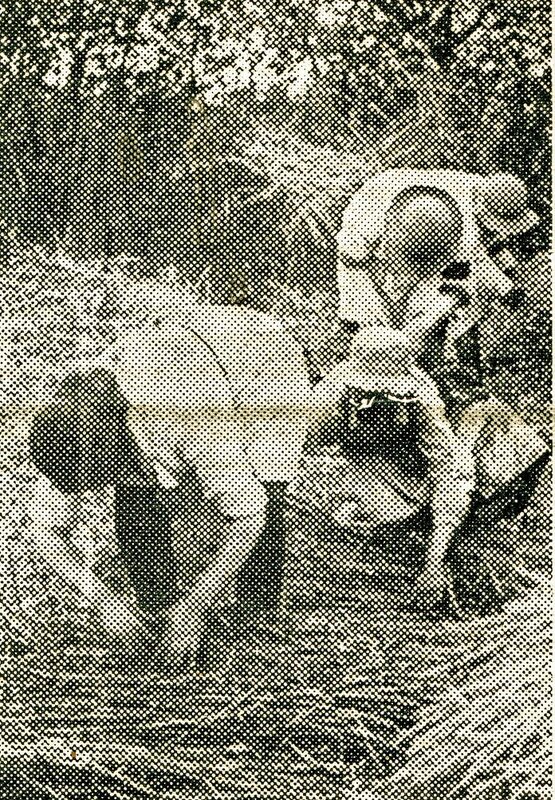 In all his years on a Somerset farm, the most adept rick builder and thatcher my uncle ever saw; was a Land Girl from Stepney. 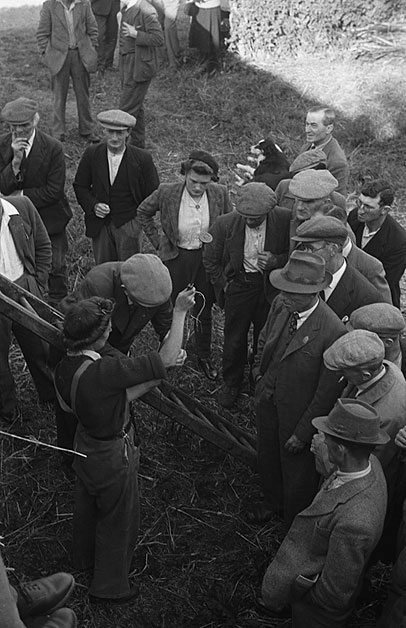 It was also claimed that ‘a novice can make a weatherproof job with it’; but the ‘Girls’, both on and off the ladder, seem to be very confident at showing off their skill with the implement. 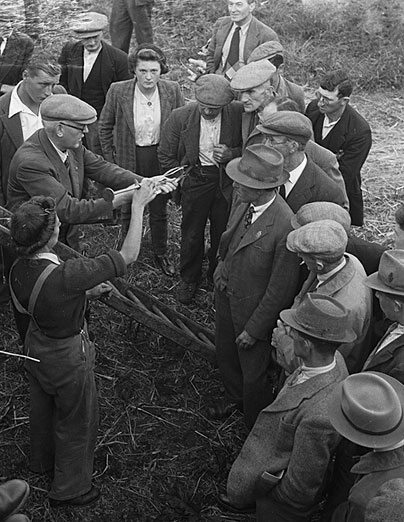 Geoff Charles has captured their audience well; interested and perhaps slightly overawed… Photos; under Creative Commons Licence, courtesy of National Library of Wales. Sisters were doing it for themselves!